Visit Hawaii’s largest coffee estate, sample estate-grown and -roasted coffees, and learn about coffee’s journey from tree to cup. Our visitor center is open 9am – 5pm daily, located at 870 Haleweli Road in Eleele. The museum exhibits coffee artifacts, and features a video describing how we grow, harvest, and process Kauai Coffee. 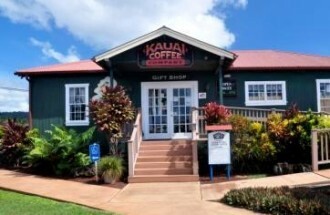 Our shop features unique Kauai gifts. Take a self-guided tour of our coffee-making process anytime, or We have free guided tours every day at 10am, 12pm, 2pm and 4pm. Join our Coffee Club and have our product delivered to your door each month! Taste the difference that is Kauai! To: Kauai Coffee Company, Inc.